The name Browning is synonymous with no-nonsense, high-performance autoloaders having superb finish and unmatched handling. And with an easily recognizable semi-humpbacked receiver silhouette, Browning’s Silver shotguns perfectly honor that historic legacy. Sharing the same proven Active Valve gas operation as the Gold, the Silver is one of the softest recoiling and easiest shooting guns available today, delivering up to a 50% decrease in felt recoil over the competition. The Active Valve also makes the Silver one of the most versatile and reliable shotguns around, able to fire a wide range of factory loads under the most extreme conditions. Back-Bored Barrel Technology ensures your shot patterns are tight, dense, even and consistent, and provides an additional reduction in felt recoil. See your Browning dealer and pull the trigger on a new Silver today. 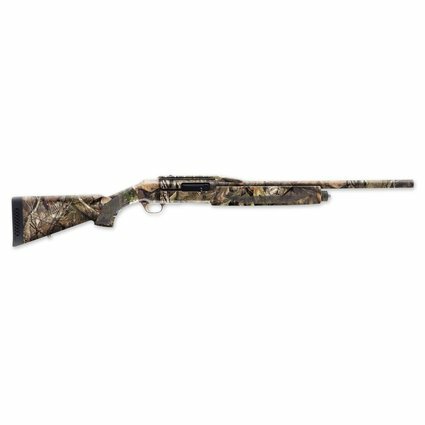 The Silver Rifled Deer shotgun is an efficient and sleek design, built with the purpose of knocking whitetail flat. The rifle barrel has a three inch chamber and is designed with thick walls to handle high pressure from slug cartridges. The cantilever mount will accommodate a scope, red dot, or reflex sight, for fast acquisition and accurate fire. The cantilever mount allows you to attach a scope to the barrel so you can keep your zero while swapping out barrels for hunting birds or busting clays.